Go to aromatherapy school at home! Aromatherapy 101 (170 hours) the first step. Aromatherapy 201 (375 hours). Full Professional Course 101 and 201. Bodywork options Aromatherapy 301 or Aroma Massage DVD. Recognized by Associations in Canada and USA. Essential oils not only smell wonderful (most anyhow! ), but essential oils like lemon and orange can help dissolve grease while oils like lavender, tea tree, frankincense, cedar and thyme can help kill germs and keep your surfaces clean. It's easy to make your own natural essential oil spray surface cleaner and customize it to use your preferred essential oils. This recipe will get you started! 16 fl. oz. PET Plastic or Glass Bottle with Sprayer Top (See above for sourcing information). It is okay to use PET plastic for spray cleaners as the cleaner contains mostly water and only a fraction of essential oil. You can tell if the bottle is made of PET plastic by looking for the symbol on the bottom of the bottle. Although you can purchase glass bottles with sprayer tops, I do not recommend using glass bottles for spray cleaners. Often when spraying, you may move swiftly and may have a greater risk of dropping the bottle or bumping it into something and breaking it. Amazon.com sells empty spray bottles. Below is a link to a 16 fl. oz. PET plastic spray bottle that I have been using successfully. If you click on this link and purchase through Amazon, AromaWeb will earn a small commission. Thanks in advance! Add the water, white vinegar and your chosen essential oil blend to your 16 fl. oz. spray bottle. Shake well. The recipe makes only approx. 15 fl. oz. of cleaner so that you have ample room on the bottle to shake the mixture thoroughly before and during each use. If you find that you would like your surface cleaner to be slightly soapy in consistency, you can experiment by replacing .5 fl. oz. of the water with castile soap. White vinegar is recommended as it is more translucent and is more suitable for use in a cleaning spray. Additionally, apple cider vinegar can contain natural particles that could potentially clog your sprayer or land on your surfaces. I prefer to use white vinegar for my cleaning applications and save my apple cider vinegar for my nutritive and culinary applications. Before and during each use, shake the mixture well. Essential oils do not stay mixed in water, so it's crucial that you shake the blend frequently. Important Precaution: Before you use the spray on each new surface, do a spot check on an inconspicuous area, and allow ample time for it dry to ensure that the essential oils and vinegar do not damage the surfaces you intend to clean. Once you are sure that the spray is suitable for your surfaces, apply and use as you would any other surface cleaner. These recipes are offered for educational purposes only. Before using any essential oil, carefully read AromaWeb's Essential Oil Safety Information page. For in-depth information on oil safety issues, read Essential Oil Safety by Robert Tisserand and Rodney Young. Do not take any oils internally and do not apply undiluted essential oils, absolutes, CO2s or other concentrated essences onto the skin without advanced essential oil knowledge or consultation from a qualified aromatherapy practitioner. For general dilution information, read AromaWeb's Guide to Diluting Essential Oils. If you are pregnant, epileptic, have liver damage, have cancer, or have any other medical problem, use oils only under the proper guidance of a qualified aromatherapy practitioner. Use extreme caution when using oils with children and consult a qualified aromatherapy practitioner before using oils with children, the elderly, if you have medical issues or are taking medications. Do You Need the Ingredients Listed in This Recipe? 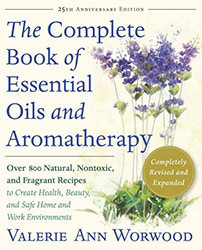 You can find the essential oils, other ingredients and packaging that you need by patronizing the fine companies that support AromaWeb with their banner advertising located throughout AromaWeb (See them all at a glance within the Advertiser Spotlight area) and the listings located within the Global and Regional Aromatherapy Business Directories. Many of AromaWeb's advertisers also expertly formulate their own ready-made products if you decide you'd rather not make aromatherapy products yourself. Do You Want More Essential Oil Recipes and Blends? Also known as "The Fragrant Pharmacy" in the UK.